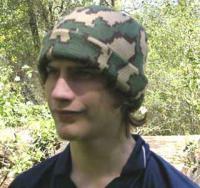 This hat style was made famous by Bob Fratzke. 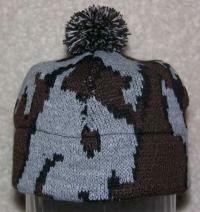 It can be worn with the 3 color camo colorway on the out side or Reversible to Solid Blaze Orange. This makes it double thickness. It easily comes down to cover the ears. 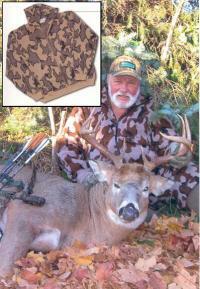 The soft bill in the front shades the eyes but is not so big that it will interfere with a bowstring. If you want the warmest for cold weather consider the Elite version which has merino wool / acrylic blend. 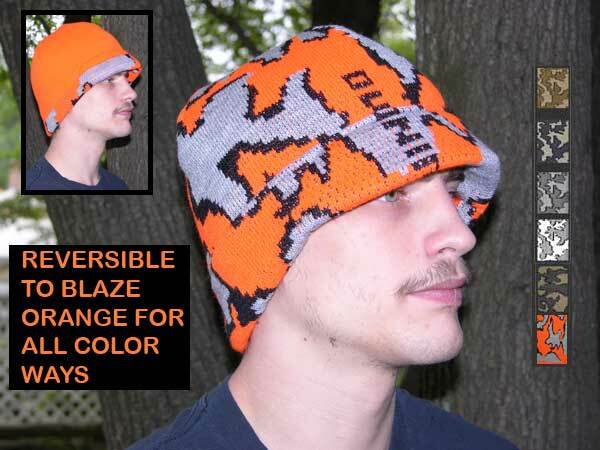 This hat is not offered in 100% merino because the wool yarn is not 'neon orange' enough' to meet the state hunting regulations. 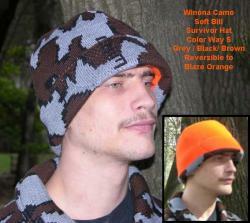 Therefore the Elite hat uses merino as the non orange colors and acrylic for the hunter blaze orange lining. 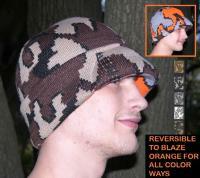 Check out our photo which shows both reversible ways of wearing the cap. Also refer to your states hunting regulations concerning wearing Blaze Orange. The sewing pattern and body style were reconstructed from a sample provided by Bob Fratzke. Bob was kind enough to send the soft bill foam inserts left from the days he made this hat in his factory. to The Knit Tree. Sharon Nani owner of The Knit Tree used the Garment Designer Software by Cochenille to facilitate in the recreation process. Submitted by Emailed in Review on Fri, 08/09/2013 - 21:10.